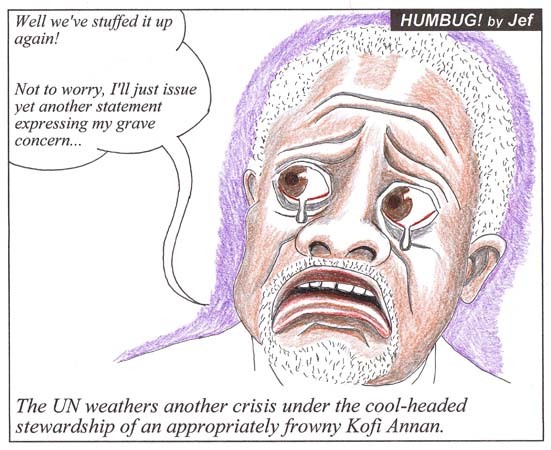 I have posted this generic Kofi Annan cartoon so I can link to it as each new UN fiasco makes the headlines. The cartoon will fit any conceivable UN fiasco in the future - so long as Kofi remains in charge. A monumental stuff-up by a minister in an elected government typically leads to a resignation. In the UN, such stuff-ups lead to an expression of concern from the chief executive. If the stuff-up is breathtakingly bad, the chief executive - when pushed - may even express grave concern.